It’s all gloom and doom on the fishing front this weekend. Seems like the storm last week didn’t improve the fishing, but diminished it. Only a few catches reported, none of the standard bluefish blitzes, but we did get this huge photo from the Parker River. Smallest bluefish ever caught around here? Dave Rimmer said, “I got a couple fish under 30” down around Sandy Pt before the sun came up….zippo after that…except the little fellow in the attached photo. 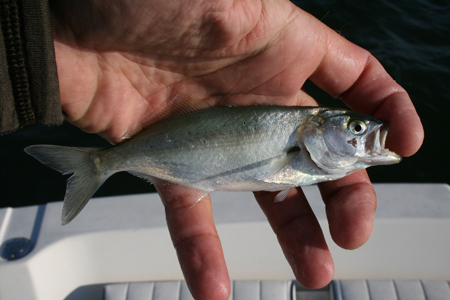 I may be mistaken, but I believe it to be the smallest bluefish ever caught in Massachusetts!! Some terns were diving on small bait off the mouth of the Essex River, and this is what was feeding on the bait, and my fly. I originally wanted a photo as an example of a nice small herring, which I thought it was….and then it started biting my finger. 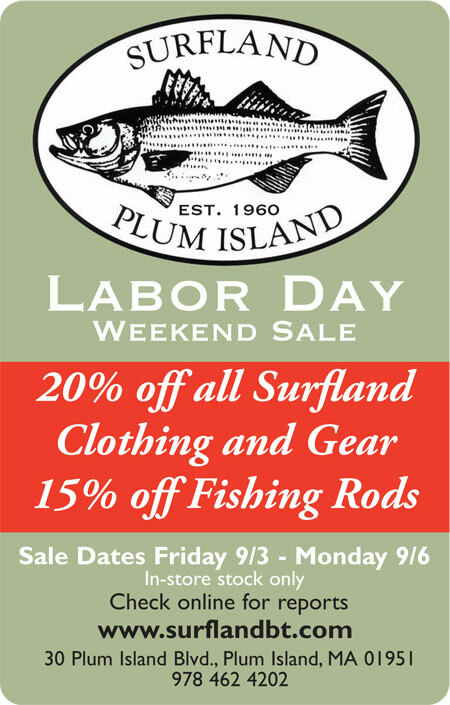 We have a couple sales this month so despite the lack of fish, we might get you a deal for coming down to the shop anyway. Two sales, one just for the weekend, and one all month. 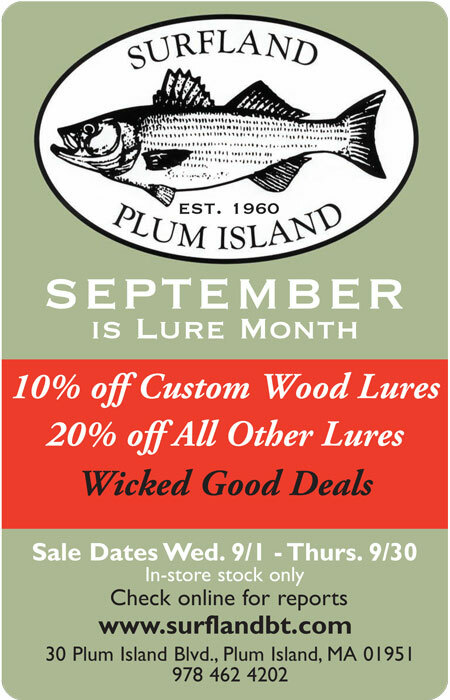 The other sale is all of September, which we’re calling “Lure Month.” Any time in September Custom Wood lures are 10% off. 20% off all other lures in the shop. In stock items only. ITS turned into a full and complete bust..there are no fish! If one enjoys catching skates….one will enjoy the effort. No one is catching fish from the surf…DANIELLE has created a huge surf and lots of debris and seaweed. My last 3 trips have been skunks. I see less guys fishing now as well. Went out Sunday about a mile frol Salisbury beach. It was about 1 in the afternoon and a 35 inch striper took a live eel. We also saw a ocean sunfish or mola mola come right up to the boat and swim away. Went out last about mile from isle of sholes hooked up with some real nice blues one 33″ and 6 from 29-31″ very nice fish on full herring chum for about 20min then all of a sudden hold on..
We caught a TON of blues on saturday. Mostly 9 pounds. We caught them starting at 8am and continued to catch until about 3pm. they were down around 50 feet…. so pretty deep.. also picked up some nice stripers Friday night in the river…12:30am actually.. 40″ and a 45″ … both were released..
Rich, sounds sweet, I’m guessing from a boat. The surf was a bust.